Article: "Law and Neuroscience in the United States"
"Law and Neuroscience in the United States"
I will be traveling to a professional conference starting tomorrow and extending thru the entire week. Thus, the only posting you may see might be "push" FYI posts. Your Gale Search Alert has updated content. 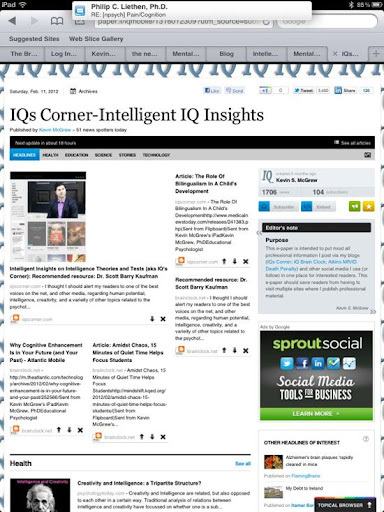 Click here to view the complete list of articles matching your search. Cooper, William E. "Social Science in Law: Cases and Materials." Law and Psychology Review Spring 1988: 123-127. LT. Web. 18 Feb. 2012. Hughes, John Starrett. "The insanity defense: philosophical, historical and legal perspectives." Law and Psychology Review Spring 1985: 103-107. LT. Web. 18 Feb. 2012. Powell, Gary. "Competency to stand trial." Law and Psychology Review Spring 1982: 87-95. LT. Web. 18 Feb. 2012. Durham, Charles H., III. "The psychology of eyewitness testimony." Law and Psychology Review Spring 1982: 97-107. LT. Web. 18 Feb. 2012. Alexander, Charysse L. "Judge, lawyer, victim, thief: women, gender roles, and criminal justice." Law and Psychology Review Spring 1985: 109-115. LT. Web. 18 Feb. 2012. Ward, Walter G. "The psychology of the courtroom." Law and Psychology Review Spring 1984: 135-146. LT. Web. 18 Feb. 2012. Durham, Charles H., III. "Eyewitness testimony: psychological perspectives." Law and Psychology Review Spring 1982: 97-107. LT. Web. 18 Feb. 2012. The Woodcock-Muñoz Foundation has established an institute to support the advancement of contemporary cognitive assessment and to provide professional growth opportunities for practitioners, students, and faculty. In recognition of the many contributions that Dr. Richard Woodcock has made to the field of psychology and cognitive assessment, the institute is named in his honor. We invite our university grant programs to collaborate with the WMF on this venture by serving as a host site. Our plan is to hold each Institute at a different university so that professionals in various geographic locations can have access to this opportunity for professional growth. The Institute is a one-day event featuring nationally-known speakers and topics related to contemporary cognitive assessment and theory. The first Institute will feature Dr. Richard Woodcock as the keynote speaker and Dr. Kevin McGrew and Dr. Nancy Mather as the session presenters. Our first host site is Tufts University and the Institute will be held September 29, 2012. Details regarding the inaugural Institute will be available at the WMF website (www.woodcock-munoz-foundation.org) by March 30, 2012. If you are interested in serving as a host site or have ideas for topics or speakers for future institutes, please contact Barbara Wendling, Director, Richard Woodcock Institute, at b.wendling@woodcock-munoz-foundation.org. A number of months ago I started two different daily e-newspapers. It took a while to find feeds that provided good content related to each paper, but I think things are good now. However, I will continue to revise those feeds that are searched and incorporated with regularity. The two papers are below with links to where you can subscribe by hitting the subscribe button at each page. You should be able to subsribe and have an email in your inbox each day. You do NOT need a Twitter or Facebook account to subsribe..which was a common complaint I had earlier. That problem turned out to be my error as I was providing people a link to my personal sign-in page. Enjoy. There is some overlap in content. 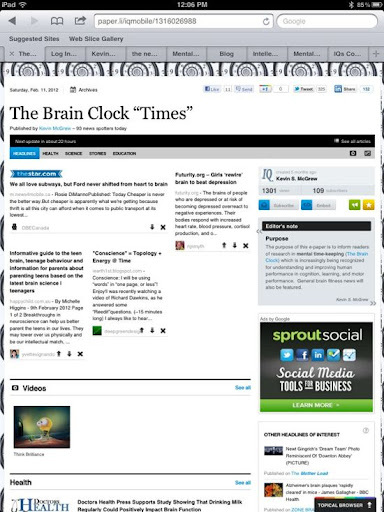 The Brain Clock "Times." This is associated with the Brain Clock blog. See web/blog roll for link to this new resource. 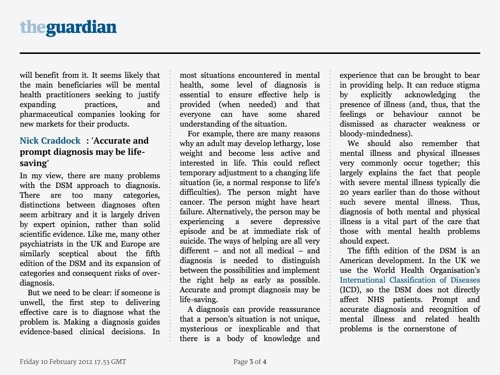 Article: Do we need a diagnostic manual for mental illness? Thanks (again) to Kevin Foley for sending two more recent Atkins decsions. Of interest in the Hearn case is that he had two IQ scores (88, 93) well above the bright-line cut score of 70. Hearn's defense tried to argue for a more expansive definition of mental retardation based on neuropsychological testing and a diagnosis of fetal alchohol syndrome (FAS). Hearn's prior 2010 decision is also available. IAP Applied Psychometrics 101 Brief Report # 11: What is the typical IQ and adaptive behavior correlation? What is the typical relation (correlation) between standardized measures of adaptive behavior (AB) and measures of intelligence (IQ)? 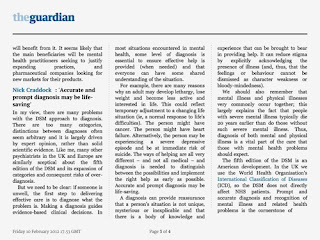 This is an important question given the role both play in the definition diagnosis of mental retardation (MR) / intellectual disability (ID). During the late 1970's and 1980's this was an active area of research. Numerous studies were published that reported correlations between a wide variety of adaptive behavior scales and intelligence tests. Probably the best synthesis of this research was provided by Harrison (1987). Harrison's review included a table of over 40+ correlations. This is Table 2 in the above referenced and linked article. Harrison concluded, as have most others who have reviewed the literature, that "the majority of correlations fall in the moderate range" (p.39). When the correlations with maladaptive measures are excluded from Harrison's table, the correlations range from .03 to .91. This is a wide range. Harrison could not identify a specific explanation for the variability or range of correlations. Harrison speculated that variables might impact the magnitude of the correlations were the specific adaptive behavior or measure of intelligence used and differences in sample variability. Subsequently the Committee on Disability Determination for Mental Retardation published a National Research Council report (Mental Retardation: Determining Eligibility for Social Security Benefits; Reschly, Meyers & Hartel, 2001) that also addressed the AB/IQ relation. The report concluded that AB/IQ studies report correlations "ranging from 0 (indicating no relationship) to almost +1 (indicating a perfect relationship). Data also suggest that the relationship between IQ and adaptive behavior varies significantly by age and levels of retardation, being strongest in the severe and moderate ranges and weakest in the mild range. There is a dearth of data on the relationship of IQ and adaptive behavior functioning at the mild level of retardation" (p. 8). 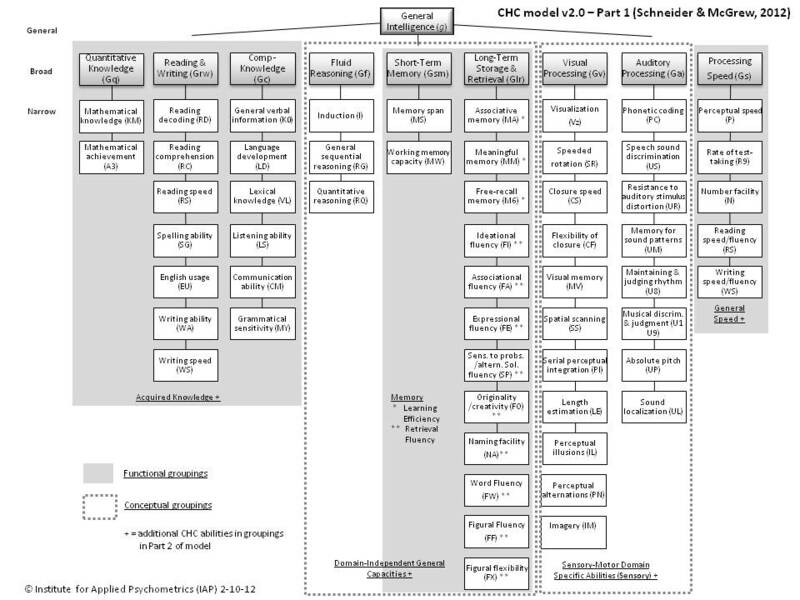 Factors identified as moderating the AB/IQ correlation were scale content, measurement of competences versus perceptions, sample variability, ceiling and floor problems of the scales, and level of mental retardation. Given the above, it is hard to render an objective statement on the approximate typical AB/IQ correlation. With this in mind, an informal research synthesis was completed and is reported here. First, only the AB/IQ correlations (IQ/maladaptive correlations were excluded) from Harrison's 1987 table were extracted (n = 43 correlations). Then, the technical manuals for the current editions of the three most frequently used contemporary adaptive behavior scales were reviewed for additional correlations. This included the Vineland Adaptive Behavior Scale (Sparrow, Cicchetti & Balla, 2005; n = 2 correlations of .12, .20) and the Adaptive Behavior Scales--II (Harrison & Oakland, 2008; n = 10 correlations ranging from .39 to .67; median = .51). Although six different correlations were reported in the Scales of Independent Behavior-Revised manual (SIB-R; Bruininks, Woodcock, Weatherman & Hill, 1996), the values were not used as they are inflated estimates when compared to the type of correlations typically reported. For example, very high correlations of .79, .82 and .91 are reported for certain groups. A close reading of the tables reveals that the SIB-R correlations with either the WJ or WJ-R intelligence test were calculated on the basis of the W-score growth metric. By definition, a growth metric includes age variance. If correlations are reported across wide age groups the correlations convey variance related to the correlation between the AB and IQ constructs but also contains shared variance due to the influence of general age-base development (age). Thus, the SIB and SIB-R correlations with IQ, although not wrong and providing different information, are not comparable to all other reported correlations where age variance has been removed (typically by correlating age-based standard scores). Clear evidence for this point comes from McGrew and Bruininks (1990) who used the same SIB/WJ subject data reported in the SIB and SIB-R manuals, but who removed the W-score confounded age variance prior to the calculation of latent factor correlations (via confirmatory factor analysis) between latent practical intelligence (SIB adaptive behavior) and conceptual intelligence (WJ IQ) factors. The resulting AB/IQ correlations for three different age groups were .38, .56 and .58--far below the values in the .70 to .92 range. Thus, the values from McGrew and Bruininks (1990) were included for estimates of the SIB/SIB-R IQ correlations in the current synthesis. Finally, latent AB/IQ correlations (as estimated from confirmatory factor analysis models) of .27 and .39 were included from Ittenbach, Spiegel, McGrew and Bruininks (1992) and Keith, Fehrmann,Harrison and Pottebaum (1987), respectively. This process resulted in the addition of 17 AB/IQ correlations to the 43 from Harrison, for a total of 60 correlations. Descriptive statistics for this collection of 60 AB/IQ correlations are as follows: range of correlations from .12 to .90, a mean of .51 and a median of .48, and a standard deviation of .20. Below is a figure that includes a frequency polygon (and smoothed normal curve overlay) and a box-whisker plot of the data set. A review of the box and whisker plot (at the bottom) shows the median correlation (.48) as a vertical line within the rectangle. The rectangle includes the 50% middle of the distributions of correlations and shows an approximate range of just below .40 to just above .65. Of particular note is the shape of the frequency polygon and smoothed normal curve. The shape of the frequency polygon is consistent with a normal curve. In quantitative research synthesis this type of normal distribution suggests that total data set included in the review is not biased--both studies that are likely under- or overestimates of the "true" population correlation (due to method or sampling factors) are included. More importantly, the "bunching" up of the majority of the correlations in the middle provide confidence that the median of this distribution is a reasonable unbiased estimate of the populaiton correaltion. 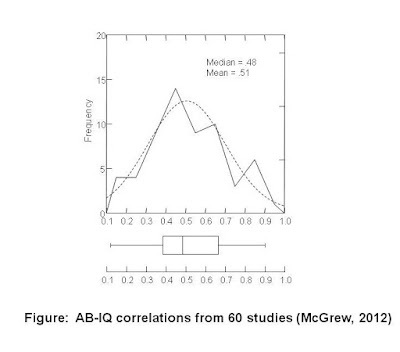 This type of relatively normal distribution suggests that the current collection of 60 AB/IQ correlations is likely a reasonable approximation of the complete set of population AB/IQ correlations. 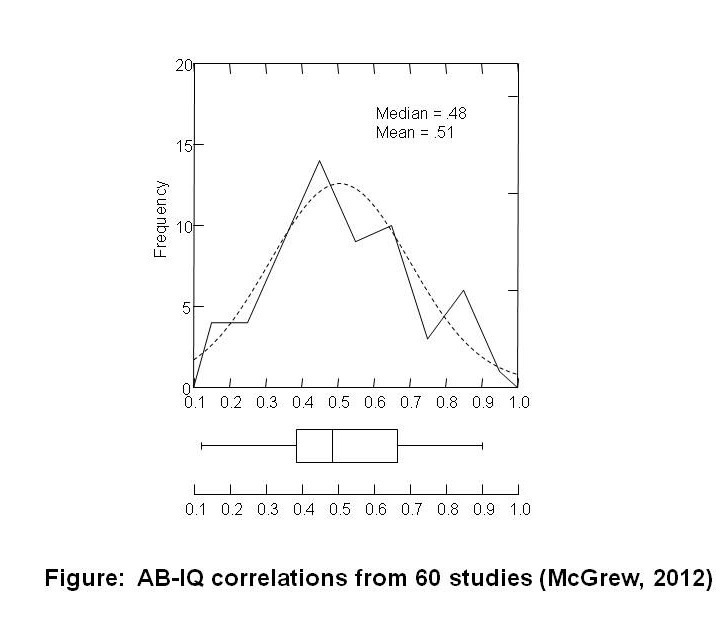 Based on this informal (and admittedly incomplete review of all possible AB/IQ correlation research) one can conclude that a reasonable estimate of the typical AB/IQ correlation is approximately .50 (mean = .51; median = .48), with most ranging from approximately .40 to .65. This finding is consistent with Harrison's 1987 conclusion of a "moderate" correlation. The current analysis continues to reinforce Harrison's (and others) conclusions that adaptive behavior and intelligence are statistically related constructs, but they are still independent. An average correlation of .50 indicates that AB and IQ share approximately 25 % common variance (approximately 15% to 40 % common variance if one looks at the range of the 50% middle of the distribution of values). In practical terms this means that for any individual, standard scores from AB and IQ tests will frequently diverge and not always be consistent. A comprehensive review of all possible published and unpublished AB/IQ research studies was not completed. Clearly there are more studies "out there" that could be added to the synthesis. The analysis makes no attempt to determine if there are moderator effects. That is, is the typical correlation likely to systematically vary as a function of AB measures, IQ measures, variability in the sample's level of functioning, manifest/measured versus latent variable correlations, level of ability, etc.? This has not been peer reviewed. NY Times editorial on "Race and Death Penalty Juries"